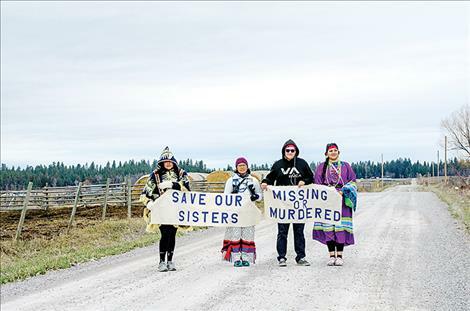 Lauren Chief Elk, Marita Growing Thunder, Shannon Ahhaitty, Erica Shelby and Kyan Bishop walk on the back roads near St. Ignatius to raise awareness about the issue of missing or murdered indigenous women. 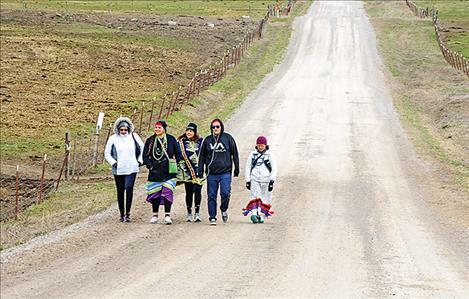 Marita Growing Thunder, 19, held in tears for a moment as she walked on the back roads last Tuesday to bring awareness to all missing or murdered indigenous women. 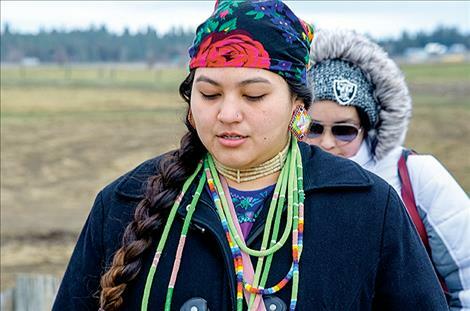 She was on the third day of a four-day journey across the Flathead Indian Reservation that started at the farthest northern edge and ended on the southern side with about 80 miles in between. The exact numbers of missing or murdered Native women are not known in the United States. Growing Thunder said there isn’t a data base with those records to know the exact extent of the problem, and she would like that to change. According to the Department of Justice, native women on some reservations are ten times more likely to be murdered than other Americans. Growing Thunder cites this statistic and says the violence against indigenous women has occurred for centuries. She said it’s time to change this historical trend. “It’s not impossible to be a decent person,” she said. Walking about 20 miles a day made her feet and ankles ache. She occasionally stopped to put ice packs on them and stretch, but she welcomed the pain. She said sacrifice is part of loss for many Native American cultures like the ceremony of cutting off long hair when someone dies. The pain she feels is her sacrifice for murdered indigenous women. She thinks of their stories as she walks and also feels emotional pain imagining what some of the women might have endured. She first brought awareness to the issue about two years ago at the age of 17 by wearing different Native American style dresses to school every day during her senior year at Polson High School. 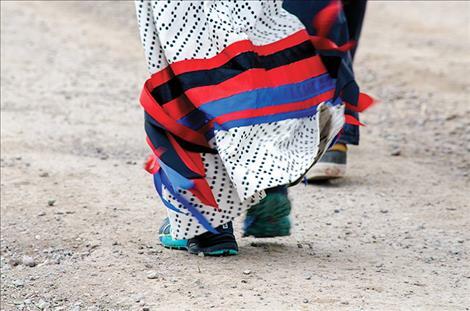 She also wore Native style dresses as she walked across the Flathead Indian Reservation in 2017 for the first time to draw attention to the cause. On Tuesday, during the second journey, the purple hem on the Native style dress she wore swayed as she walked. She designed and sewed this dress, like many other dresses, with the memory of a missing or murdered woman. The mother of one of the victims she walked to remember gave her the purple cloth and ribbon for this dress. Growing Thunder said the woman she wore the dress for was 29-year-old RaeLynn Charlo, who was murdered in Charlo in 2014. Charlo’s husband, who is currently serving a 60-year sentence, killed her in her home. Stories like this are common, she said. Growing Thunder plans to continue working to bring awareness to the issue in the hopes that things will change if enough people are aware of the problem. She wants resources made available for experts to study the problem and find solutions. She wants tribes to have a national database of those who are missing in an effort to help find them. She wants law enforcement to have more funding to investigate these crimes so that perpetrators know there will be punishment. 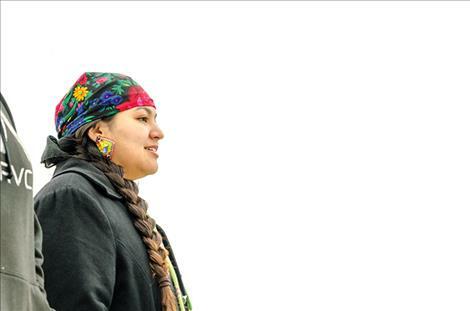 “When something happens, we don’t want people to say it’s just another Indian,” she said. She has talked to many people about the issue in the past few years and found that it’s not a political matter. People on both sides of the political spectrum have shown support for her work. She said people overall believe society needs to change in the way indigenous women are valued. She said only a few people haven’t been supportive of her cause. She was spit at once while walking the reservation. She said an action like that probably comes from a place of defensiveness and not really understanding the message. She described another response as that of confusion after she set up a memorial for missing or murdered indigenous women on the University of Montana campus where she is now going to school. She hopes her work develops into a nonprofit organization to help fund search parties to look for the missing. She also wants to help with funeral costs. 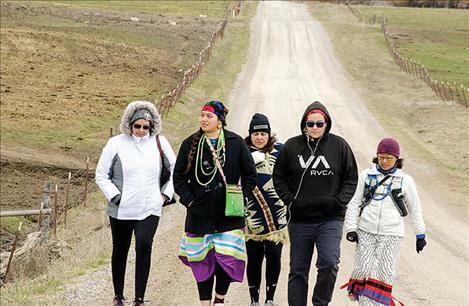 During the four day walk, different people joined her. High school students from all over the state were participating in a leadership program in Pablo, and they stepped outside to walk a few miles. Growing Thunder’s mom, Shannon Ahhaitty, walked again this year. Kyan Bishop traveled from Helena to walk with the group. Kristin Burke traveled from Los Angeles, California to participate and develop a short documentary. She works in film and costume design and donated fabric for some of the dresses Growing Thunder made. Lauren Chief Elk of Montana walked with the group. She has worked on many preventative measures regarding violence against indigenous women. She said this is not just an individual issue, but also a structural issue within society. She believes change can occur with a cultural shift where communities come together to teach respect for women and shame for the perpetrators of abuse. Erica Shelby of Pablo walked for the cause again this year. She said the Violence Against Women Act was a huge step toward helping women but more needs to be done. The federal law provides funding for investigation and prosecution of violent crimes against women and for victims’ programs. She said laws need to be created to allow counties and tribes to work together on this issue along with an allocation for needed resources. She credited Growing Thunder’s work for helping to start a “change in atmosphere” with the issue of missing and murdered indigenous women.